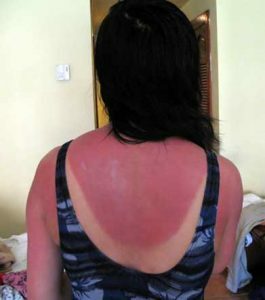 A sunburn is caused by the ultraviolet (UV) rays in sunlight (or sometimes from a sunbed). With too much exposure to UV, your skin may become red and painful, and if the overexposure is excessive, your skin may later peel or blister. Your skin goes red, because the small blood vessels in the skin dilate and more blood flows through the skin. If you have fair skin or red hair you are likely to burn more quickly than people who tan easily or have a naturally dark skin. Sunburn does not only happen in hot weather. A breeze, cloudy sky, or swimming may make you feel cooler, but UV rays can still damage your skin. You are most at risk for developing sunburn around the middle of the day, when the sun is highest in the sky. Seek shade around the middle of the day when the sun is strong. Cover up by wearing clothing – balding men will certainly benefit from wearing a hat. Apply sunscreen with a SPF higher than 15 to sites such as the face and neck which can’t be easily protected by clothing. Drink plenty of fluids to replace the water lost through sweating in the sun. Do not drink alcoholic beverages, because it will dehydrate you further. For mild sunburn, apply a moisturizing lotion or a special aftersun cream obtained from a pharmacy. Both help to cool the skin, as well as moisturizing and relieving the feeling of tightness. Hydrocortisone 1% cream can be helpful as can calamine lotion for relieving itching and soreness. For adults, painkillers, such as acetaminophen or ibuprofen can help relieve pain and reduce swelling. In severe cases, you may need treatment by a physician.